A quick stir-fried dish for our dinner. 3) Heat up the wok with some oil and stir fry spring onion, ginger and chili until fragrant. 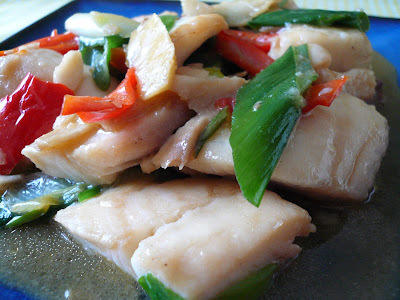 4) Add in fish fillets and stir fry gently to avoid breaking up the fish. 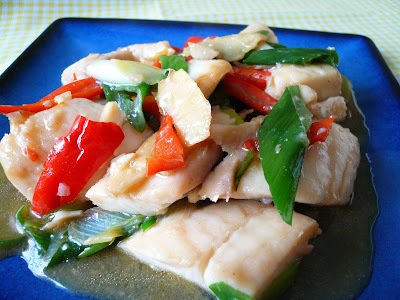 5) Once the fish changes color add in the sauce and stir until sauce thicken. 6) Check seasoning and serve immediately with warm rice. i dont normally use wine to cook mine, i guess thats why mine doesnt taste as good. Yum Gert... Eh, what type of fish is that? Cat Fish? Tilapia? or Flounder? Ada tak resipi fish yang tak pakai minyak. My son kena chicken pox and my mom kata kena pantang ayam,daging and minyak. tolonglah gert.. my son is bored to death with fish soup everyday. Zaza, Chinese used a lot of cooking wine when doing stir-fry. Cat, I used Talapia fillet because the meat is much firmer then the rest. Beachlover, this dish is fast and easy. Don't have to spend too much time in the kitchen. We love fish! hehehehe can we have some?